And now we get to cap that off with the real weekend. 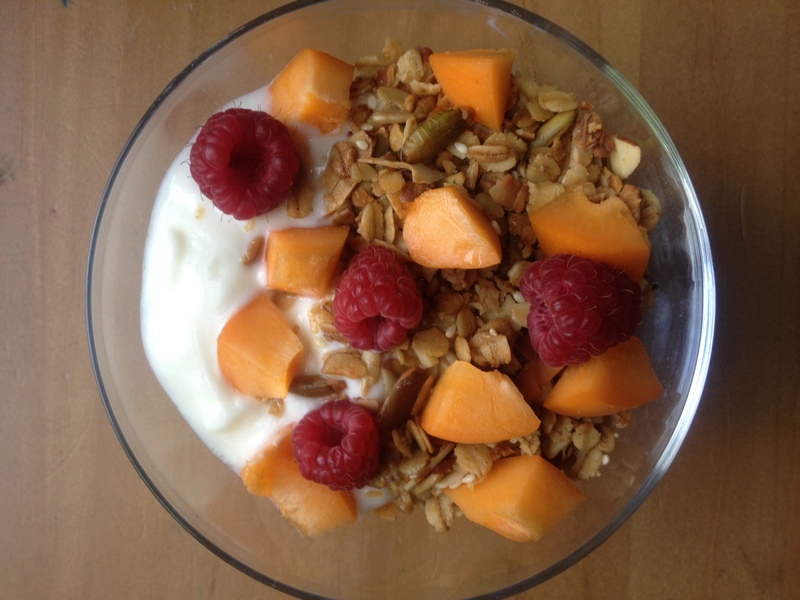 I, for one, am celebrating with one more foray in my effort to become the web’s preeminent source of granola recipes. (Ok, not really, but there are a lot of granola recipes on this website: that deliciously sugary olive oil granola, Heidi Swanson’s delicate and buttery granola with orange zest, currants, and walnuts, an oil-free crunchy hippie orange and almond granola, and my old standby with dried cherries). And now, maybe, my new standby–this weekend, anyway–a nearly equal proportion of oats to seeds and nuts, maple syrup and olive oil for sweet and crunch, and a serious spoonful of salt that makes it all just right. This entry was posted in Baking, Breakfast, DIY, Feeding Kids, Food, Recipes, Snacks and Apps, Vegan or Would-Be-Just-As-Good-Vegan and tagged almonds, breakfast, brunch, coconut, feeding the whole family, granola, hello, maple syrup, recipes to feed a crowd, weekend! on July 20, 2012 by emmycooks.